Probably the most popular orchids on the hanging Cube in the Orchid Atrium are the Asian Slipper Orchids, the paphiopedilums, or "Paphs." These particular Paphiopedilum hybrids are colloquially known as "bulldog Paphs" on account of their broad-faced flowers and drooping petals. 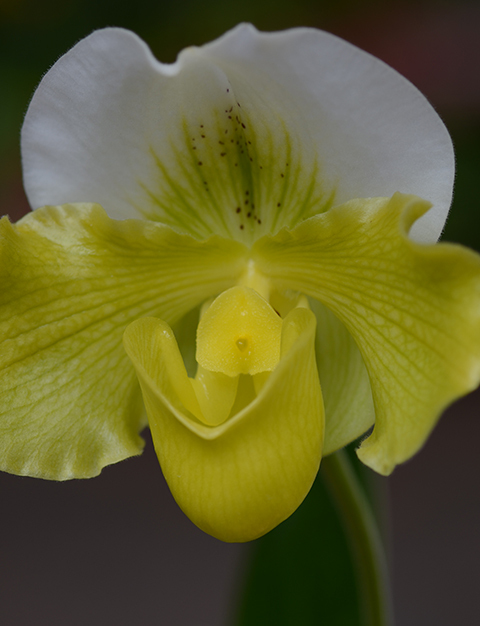 Among the most famous of the bulldogs is Paphiopedilum Winston Churchill. You can read more about this famous hybrid here. The bulldog Paphs make outstanding display orchids. Their enormous shiny flowers are mesmerizing when viewed at eye level and they are extraordinarily long lasting (for Paphs, anyway)--eight weeks if you can keep the daytime temperatures at or below 72º. Paphiopedilum species in nature are usually, but not always, terrestrial. They often grow as understory plants, or wedged into crevices in rocky limestone or granite outcrops. Adapted to an environment where there is a fairly dependable reservoir of moisture surrounding their roots, Paphs are not as drought tolerant as their epiphytic relatives, like Cattleya and Laelia, which often possess thickened leaves to resist moisture loss and pseudobulbs to store water. Thus, in cultivation, Paphiopedilum orchids enjoy more subdued light, a more moisture retentive medium, and more frequent watering than Cattleya orchids. They do well under lights or on an east facing windowsill. On a windowsill they will need a few hours of mild morning sun in order to flower. Most growers pot their Paphs in a mixture of fine grade bark, charcoal and perlite, often with some additional peat or milled sphagnum. You won't want to miss these extraordinary orchids. And don't forget your camera! The Garden is now open every night until 7 pm. 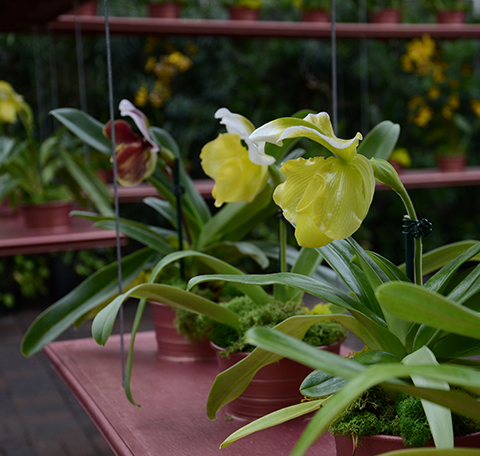 The Orchid Daze display runs through April 15.